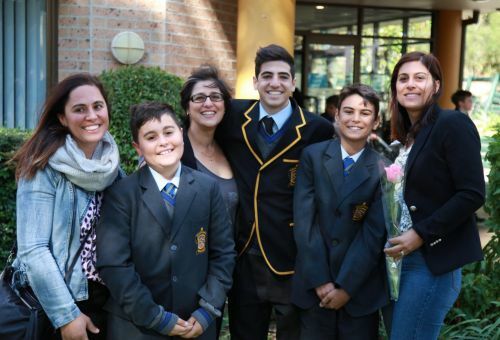 On Friday 11 May, the College held two Masses each attended by approximately 1,000 people, as motherhood, womanhood, belonging and the bond between mother and son were celebrated. This was particularly poignant given the month of May is especially dedicated to our heavenly mother, Mary. Fr Wills Melteras led us in the celebrations and we were blessed with the voices of Mrs Margaret Dix and Ms Carmel Shepherd who reflected on the readings, their role as a mother and why this event is important.The boys and young men had a chance to thank their mothers and grandmothers for all they do, presenting them with a rose, and blessing them with joy, peace and longevity. Our College musicians and choir led the community in meaningful prayer through song and we lit candles for the great women of our faith and all women who have gone before us. These women have illuminated the path for all women now and in the future, and enlivened the equal partnership between men and women. Thanks to all who were involved in any way and all who celebrated with love in their hearts.